Maintaining a proper body posture is of high importance, due to several reasons. In this article you will find out how to improve your posture. Correcting the posture will greatly relieve the shoulder, back, and neck pain. Proper posture helps digestion, provides mental clarity, hormonal balance, enhances breathing, and reduces stress. Fortunately, bad posture can be easily corrected with regular exercise. Here are the best exercises which can help you engage muscles in a natural standing position and thus restore the proper body posture. To target these muscles and tone them, you should regularly exercise the locust pose, known as shalabhasana in yoga, or a laying extension. Lie on the stomach, and touch the floor with the forehead. Extend the legs to be hip-width apart, and focus your weight on the tops of the feet. Next, gently elevate the upper body with the head up, as high as possible, but you need to feel comfortable. Inhale and elevate the head up looking ahead, and raise the hands and the fingers while exhaling. The hands should be near the body, with the palms turned downwards. Then, raise the legs up with the help of the thigh muscles, and the weight of the body will rely on the pelvis, abdomen, and lower ribs. Hold for 10-60 seconds in this position. Repeat it 5-10 times. 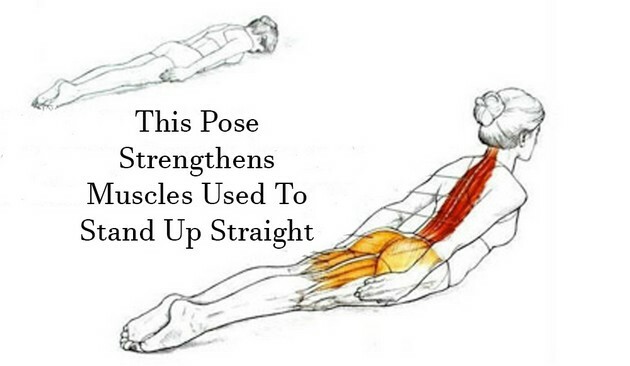 This exercise will strengthen the back muscles, torso, and the legs, and it will help you greatly correct your body posture. Yet, if you already suffer from back pain, make sure you consult your doctor before doing this or any other similar stretching exercise. 20 Radiation-Emitting Cell Phones You Need To Replace Now!